Sometimes you gotta have a little imagination when you’re playing a game. Old school gamers know this — I remember being blown away by Hook on the SNES, thinking I was soaring through snowy skies, raining death on my enemies. I called up some footage of it on YouTube the other day and saw that it’s more of a lethargic, primitive action-platformer than a high-flying adventure, but my teenage self had no problem filling in the blanks. In today’s games, not much imagination is required since teams of hundreds and powerful tools can render most anything game creators can imagine, so gamers have it pretty easy. Not with Rodea the Sky Soldier, though — this one is more than a little rough around the edges and it’s gonna take all the imagination you’ve got to see the silver lining here. 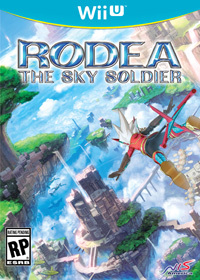 The latest from legendary developer Yuji Naka (Sonic the Hedgehog, Nights into Dreams) follows the adventures of robotic soldier Rodea, but the silly plot is secondary to a cool gameplay premise that has you flying around, Peter Pan-style, across a series of sky islands, bashing enemies and collecting strings of yellow gems (like coins or rings) along the way. The premise, at least, might get you excited and thinking that the game could hang with the likes of modern platformers like Super Mario Galaxy or at least something like Sonic Generations. The reality is far from the majesty of Galaxy or even the modest pleasures of Generations, though — Rodea is more in the realm of stuff like Sonic Lost World, where any admirable ambition the game has is buried under too many layers of problems and bad choices. The execution fails on multiple levels. First, the gameplay is a mess. Flying, during the brief moments when it works, is a fun and satisfying way to traverse the game’s floating islands, but more often it’s too fast, too slow, too finicky, inaccurate and unwieldy. Second, the presentation is uninspired. I’m more than happy to work through the very dated, simplistic graphics when there is an underlying elegance to the level design (which there often is), but the enemies are bland and many portions of the levels just feel dishearteningly empty. Third, some old-school design choices dampen what little fun remains for the patient souls who soldier on with the game despite the aforementioned issues. Having three lives and being required to restart a level from the beginning once you lose them is simply outdated design in 2015, especially when extra lives aren’t as easy to come by as they are in Mario titles or other similar games. Further, for a game that would seem to want to emphasize the freedom of Rodea’s fly-anywhere abilities, the lives system discourages you from exploring out-of-the-way areas or trying new things, for fear that you’ll have to start all over again if you slip up. The faint silver lining here is the boss fights, which offer the clearest glimpse of what Naka and his team might have accomplished with Rodea had it not turned out so fundamentally flawed. Zooming around the interior of a magical, hollow tree as you chase your foe or turning your character into a pinball of death as he attacks the various weak points of a towering iron giant — these are the moments when the game transcends its flaws and soars toward greatness. But these are fleeting moments, and the majority of Rodea the Sky Soldier is a frustrating wreck that all the imagination in the world can’t mold into something worthwhile.